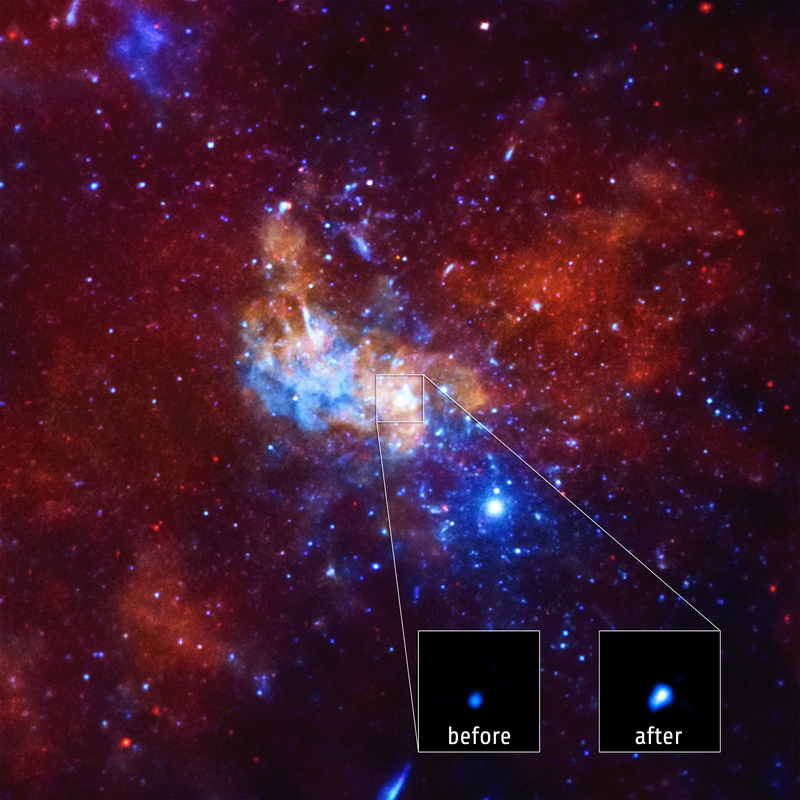 The largest X-ray flare from the Milky Way's supermassive black hole has been detected. Chandra caught this flare, which was 400 times brighter than the black hole's usual output, in September 2013. Researchers also saw a second large X-ray flare a little over a year later. Two theories are being considered to explain these large flares. Astronomers have two theories about what could be causing these "megaflares" from Sgr A*. The first idea is that the strong gravity around Sgr A* tore apart an asteroid in its vicinity, heating the debris to X-ray-emitting temperatures before devouring the remains. Their other proposed explanation involves the strong magnetic fields around the black hole. If the magnetic field lines reconfigured themselves and reconnected, this could also create a large burst of X-rays. Such events are seen regularly on the Sun and the events around Sgr A* appear to have a similar pattern in intensity levels to those. Sgr A* is about 4.5 million times the mass of our Sun and is located about 26,000 light years from Earth. Researchers have been using Chandra to monitor Sgr A* since the telescope was launched in 1999. Recently, astronomers have been closely watching Sgr A* to see if the black hole would consume parts of a nearby cloud of gas known as G2 and cause flares in X-rays. Due to G2's distance from Sgr A* at the time of the September 2013 flare, however, researchers do not think the gas cloud was responsible for the spike in X-rays. These results were presented at the 225th meeting of the American Astronomical Society meeting being held in Seattle, Washington. NASA's Marshall Space Flight Center in Huntsville, Alabama, manages the Chandra program for NASA's Science Mission Directorate in Washington. The Smithsonian Astrophysical Observatory in Cambridge, Massachusetts, controls Chandra's science and flight operations. Observation Time Main Image: 278 hours (11 days 14 hours); Inset: 13 hours 53 min. I would like to have the best data on the x-ray spectrum from Sagittarius A . Please suggest the best references of your Observatory. Approximately what number of black holes are in the Andromeda galaxy? Black Holes may be Strange Quark Spheres and not holes at all. A sphere is the most compact shape possible, so the immense amount of gravity that a black hole is presumed to have should cause it to be a sphere. I would think the x-ray flare is more likely to be emitted from material making contact to the accretion disc surrounding the black hole. I was under the impression that nothing including light can escape a black hole yet here we have a statement that x-rays are emanating from one. Or are the x-rays not FROM the black hole or just the vicinity of same? Confusing. I believe that a Black hole would not take shape or form. I think that A black Hole is a name for a space vacuum that takes matter and energy from both sides from where it stands. Do black holes have a typical shape, like a sphere or cylinder? Do they take matter from both sides? About 61 light years across.